"map" elements are inline elements. "map" elements can not have text contents. "map" elements should have "area" elements as sub-elements. A "map" element requires the "id" attribute to be specified. A "map" element should have the "name" attribute specified a reference name to be used by an image map with the "usemap" attribute. Each "area" element inside a "map" element defines a map entry for the browser to look up based on the mouse coordinates on the image map . 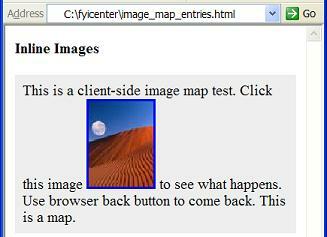 This is a client-side image map test. Click this image <img src="moonrise.jpg" alt="Moonrise"
If you save the above document as image_map_entries.html, and view it with Internet Explorer, you will see an image embedded in a paragraph. Click different parts of the image to see what happens.